Members of the Queen Alexandra's Royal Army Nursing Corps Army Reserve serve in the following UK Reserve Field Hospitals and Field Ambulances and bring a wealth of clinical and leadership skills whilst honing their military capabilities. Newcastle upon Tyne, Newton Aycliffe and Stockton-on-Tees. HQ - Newcastle, England. Stoke on Trent, Birmingham, Oxford and Shrewsbury. HQ - Birmingham. Abergavenny, Cardiff and Swansea. HQ - Cardiff, Wales. Read about Major Terri Levett who was awarded the Cavell Star Award in 2019. 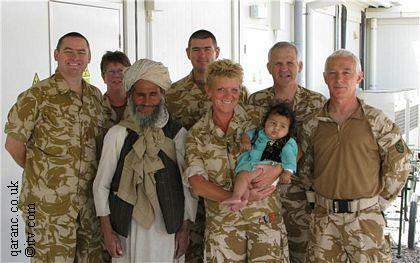 The work of 203 Field Hospital whilst at Afghanistan was shown in the TV programme Doctors and Nurses at War. Armagh, Ballymena, Belfast and Newtonards. HQ - Belfast, Northern Ireland. Aberdeen, Dundee, Edinburgh and Glasgow. HQ - Glasgow, Scotland. Blackburn, Bury and Stockport. HQ - Manchester. Liverpool, Ellesmere and Lancaster. HQ - Liverpool. Sheffield, Bradford, Nottingham and Leeds. HQ - Sheffield. Keynsham, Exeter, Plymouth and Portsmouth. HQ - Keynsham. 335 Medical Evacuation Regiment (335 MER) are a specialist unit similar to 306 Specialist Field Hospital and their HQ is also in York. This new unit was formed in 2005 from the old Ambulance Train Squadron. Londonderry, Belfast and Bridgend. HQ - Belfast. See also the history of the Territorial Army.